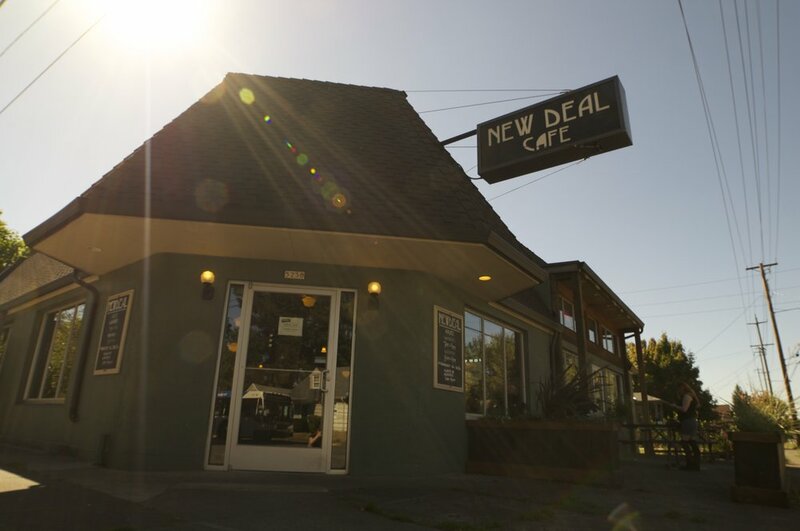 The New Deal Café offers all day breakfast seven days a week, and lunch weekdays. The ingredients are always fresh and seasonal, with a preference for local growers and suppliers of Organic produce and natural meats. Scrambles, buttermilk biscuits, sandwiches, and salads are all available. 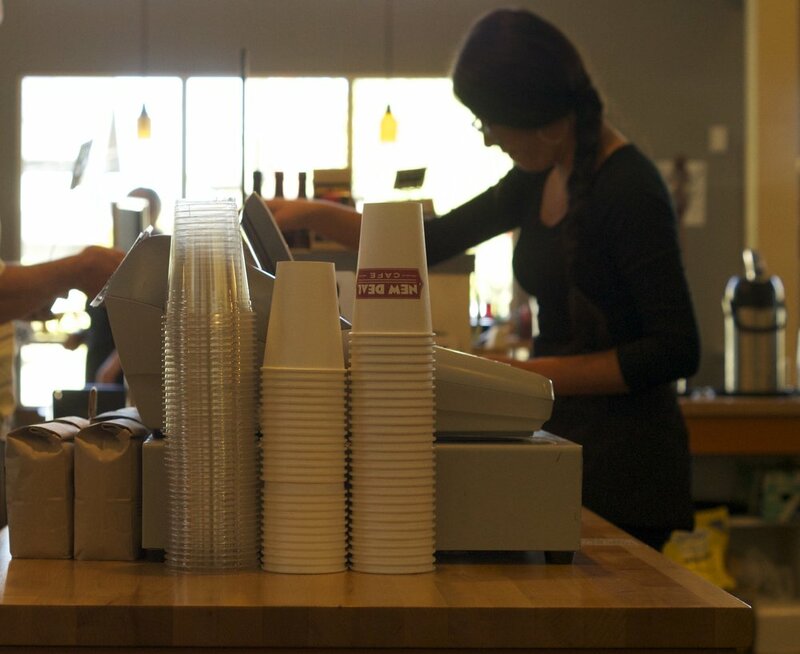 Proudly serving coffee by Stumptown Coffee Roasters with breads and pastries by Fleur De Lis bakery. Enjoy your Latte and breakfast while your children play in the large kids area. Or weather permitting, you can enjoy your meal on the garden patio. 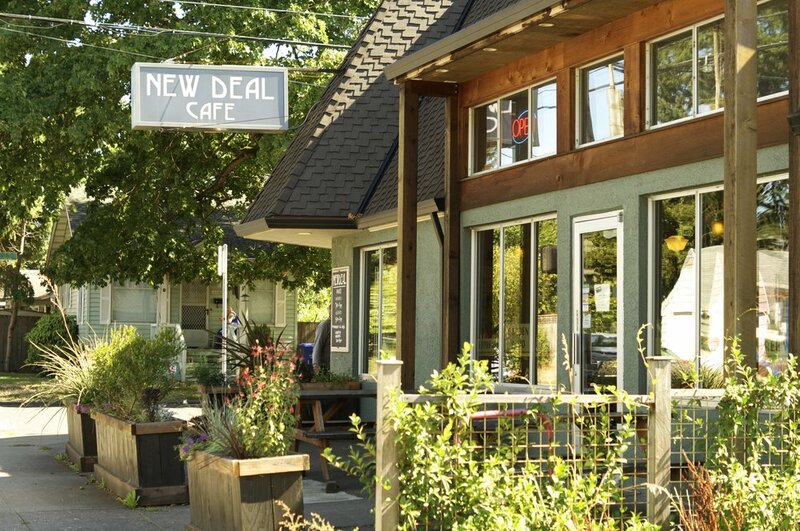 Voted top 5 Kid friendly brunch spots in Pdx/Parent Magazine. Please go to second register for pickup orders or coffee only. Made with all natural, cage free eggs. Served with home fried potatoes or mixed greens tossed with olive oil & salt. Choice of toast or house made buttermilk biscuit. Fleur De Lis Bread: Multi grain, sourdough, or rye. New Cascadian gluten free bread add $1. Tofu or egg white substitutions available. Onions, bell peppers, mushrooms and cheddar with choice of natural bacon, natural ham, chicken apple sausage, or veggie sausage. Spinach, broccoli, corn salsa, mushrooms and roasted red pepper sauce. Sun-dried tomatoes, spinach, Greek olives and feta. Fried egg sandwich with natural bacon and cheddar. On grilled bread and served with potatoes. Two eggs, with potatoes, house made biscuit or toast. Choice of natural bacon, thick slice of all natural ham, chicken apple sausage, or veggie sausage. With scrambled eggs, cheddar, jalapeños, black beans and tomatoes. Served with potatoes, sour cream, corn salsa and red salsa. Our house made buttermilk biscuits with veggie mushroom gravy. Served with potatoes and 2 eggs. Served with organic seasonal fruits. Tuna salad with cheddar. Grilled on sourdough. Turkey, swiss, coleslaw, 1000 island dressing. Grilled on Rye. Sliced chicken breast, cheddar, caramelized onions, peppers and smoked apple bbq sauce. Toasted on focaccia bread. With roasted pepper sauce, mushrooms and swiss. Grilled on sourdough. Spinach, herb roasted mushrooms, corn salsa, peppers, roasted garlic spread and tomatoes. Toasted on focaccia with feta cheese. Bacon, lettuce and tomato on toasted sourdough. Healthy portion of ham or turkey, cheddar, swiss or provolone with lettuce, red onion, tomato, and mayo. Choice of bread. Romaine, croutons, bacon, parmesan & caesar dressing. Organic baby spinach, feta, candied hazelnuts and seasonal fruit. Served with our smoked apple vinaigrette. Organic spinach topped with black beans, home fries, corn salsa, turkey breast, roasted red pepper sauce and roasted pumpkin seeds. 1/2 grilled cheese served with organic seasonal fruit. Natural berry jam & organic peanut butter. Served with organic apple wedges and veggie sticks. *Consuming raw or undercooked eggs may increase your risk of foodborne illness.